While Edmonton is still firmly regarded as beef country, there’s been a rise in the profile of seafood in our land-locked city. With better access to airlifted catch, seafood-focused restaurants such as The Black Pearl offer a rotating menu of fresh options, and home cooks can have their pick of Icelandic fish caught two days earlier from Ocean Odyssey. Closer to home, Effing Seafoods made a splash this year with a number of collaborations and pop-ups with local restaurants showcasing their Canadian sourced seafood. This year’s festival runs August 5 – September 3, 2016, and features a wide range of seafood. A few weeks ago, I was fortunate enough to be invited to preview the festival menu as a guest. Unlike previous years, Sabor Chef Lino Oliveira collaborated with Calgary-based Chef Jan Hansen of Hotel Arts for the dinner, and we learned that Chef Jan is originally from Edmonton! The collaboration also took Chef Lino down to Calgary to host a dinner at the Kensington Riverside Inn in early August. It’s always great to see chefs working together, particularly across cities. The supper was served family style, and over the course of the evening, we sampled a variety of tapas and mains. Through his choice of flavours and cooking techniques, Chef Lino transported us to the Iberian coast. 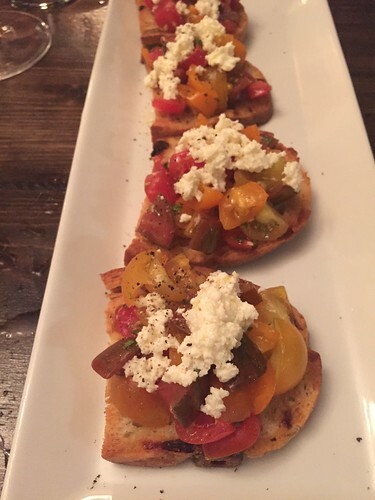 Though not featuring seafood, I loved the heirloom tomato & queijo fresco montadito, a bruschetta-like serving of fresh market tomatoes and Portuguese cottage cheese atop Chef Jan’s bread. 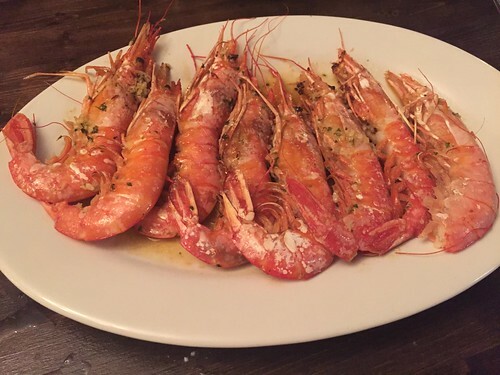 Another standout was the meaningfully messy gambas al ajillo, featuring BC spot prawns almost comically large in size. Chef Lino delighted in his recommendation to imbibe in the juices inside the head as well. 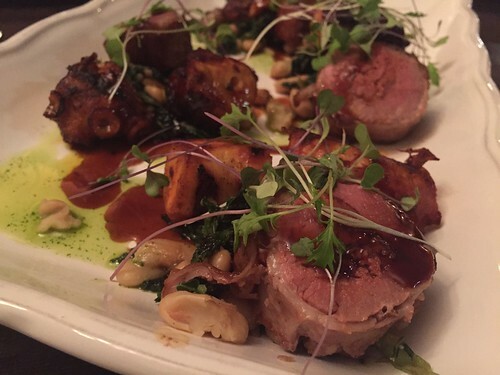 Even the surf & turf had a Portuguese twist: a charred octopus served alongside a chorizo-stuffed lamb that had been rolled in caul fat and cooked sous vide for three and a half hours. My favourite dish of the elaborate menu was the Caldeirada de peixe, a sablefish (black cod) served in a saffron-lobster broth. The skin had been perfectly crisped, and all I wanted to do was make sure the rest of the broth didn’t go to waste (even if it meant throwing decorum out the window). 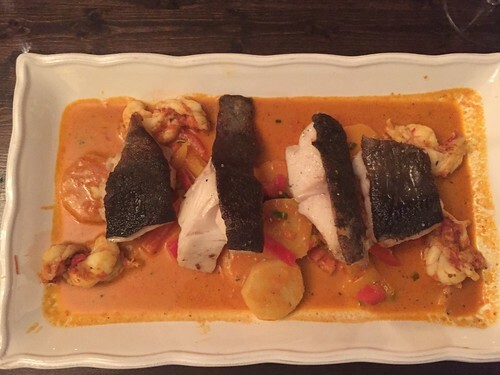 Although the final dishes that ended up on the Seafood Festival menu are slightly different, the ingredients, flavours and combinations are very similar to what we tried that evening. Thanks again to Sabor for a wonderful evening of food and hospitality! The Seafood Festival runs August 5 – September 3, 2016. Check out Andrea, Cindy and Linda’s snapshots of the evening.